Every evening of the week there was hope and disappointment, cold and wind. 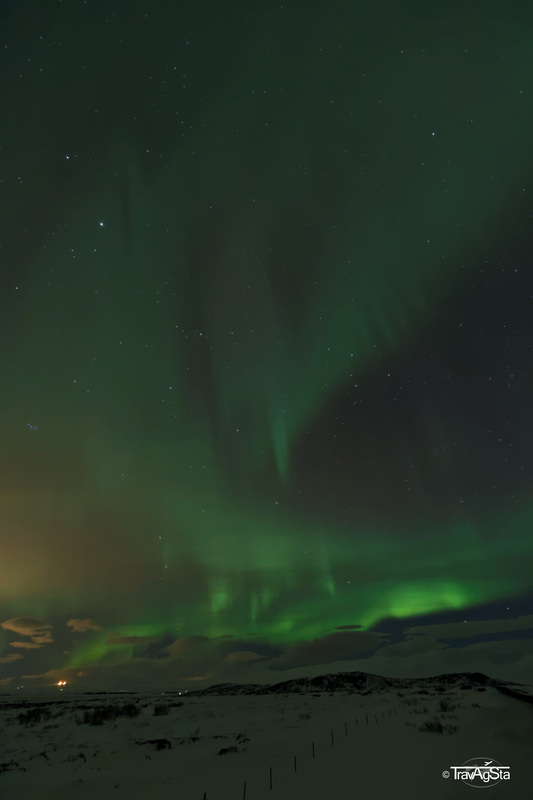 Hoping to see Aurora Borealis was one of the main reasons to fly north this winter. Well, we were already pretty exhausted by our day trips. It was quite hard to leave our warm Guesthouse again to search the night’s sky for green lights. We wore as much as possible but still we couldn’t stand too long outside. By the way it was seldomly below -2°Celsisus, while in Norway -10°Celsisus are very usual. Chasing Northern Lights there is even harder. But the wind even makes those ‘moderate’ temperatures appear arctic. 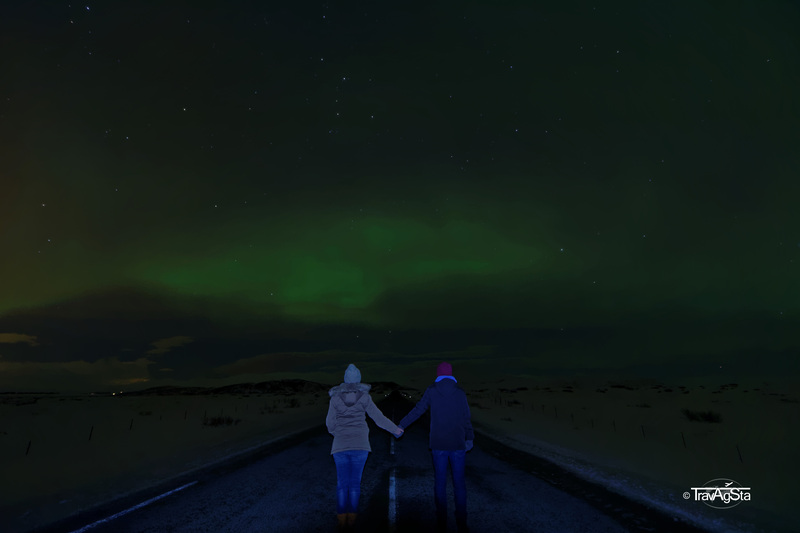 We regularly checked cloud cover forecast and the Northern Lights app and felt kind of pathetic. We knew we wouldn’t see them for the whole week maybe (or even for a month). 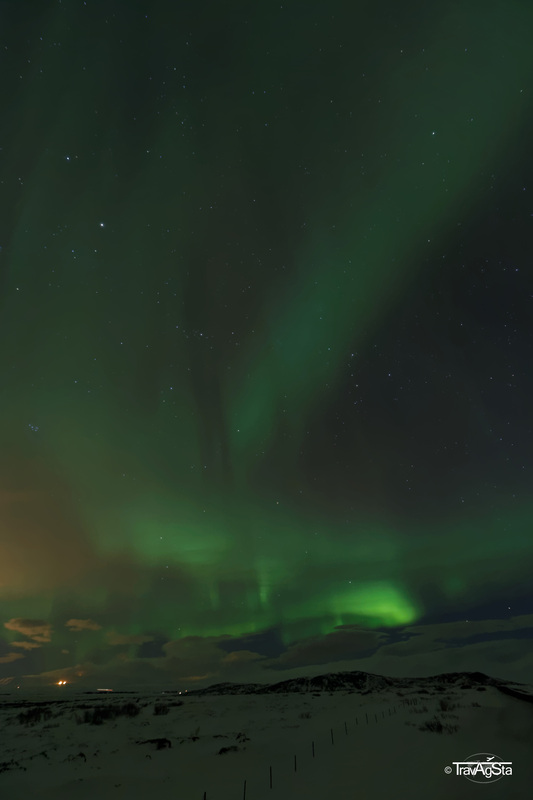 But the Aurora God was with us and at least one night there was a fantastic show in the sky. Lady Aurora danced for us! 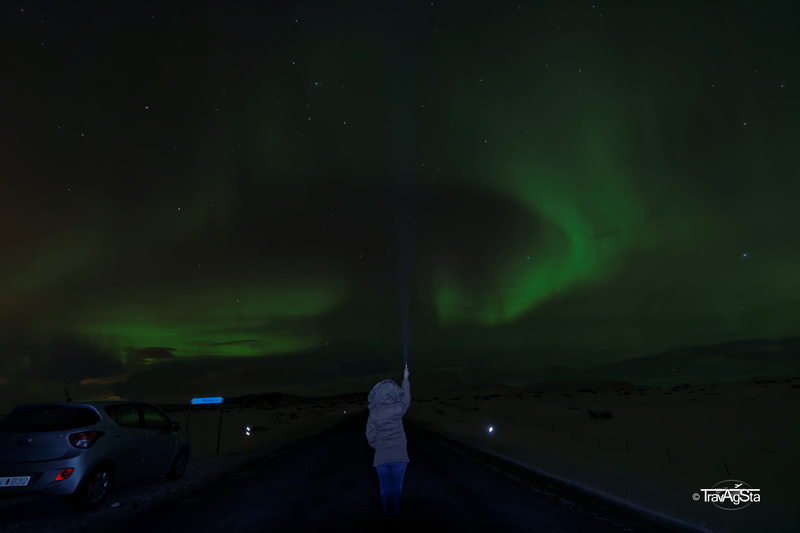 You need good luck to see Northern Lights during your Iceland trip. Besides a (almost) clear sky, you need solar activity. We lowered our expectations beforehand. But, well, secretly we hoped, of course! Check cloud cover and solar activity: Online or just go outside and have a look! If chances are good, go out and drive to a dark place. Wear warm clothes and bring hot beverages with you! Take a quick shot using your tripod to check for green spots. The camera’s sensor is more sensitive than the human eye. In the beginning we just saw a grey haze in the sky, but the photo appeared green. Some time later, it looked green to us, too! Of six evenings we spent in Iceland, we skipped two due to bad weather. One night was very mean, though. There were some clouds but we could spot green light behind. Weather becoming worse was the reason why we went home. In the remaining three clear and cloudless nights solar activity was the point. It’s measured from 0 to 9 and we experienced indices 2 and 3. This helps but is not really reliable. 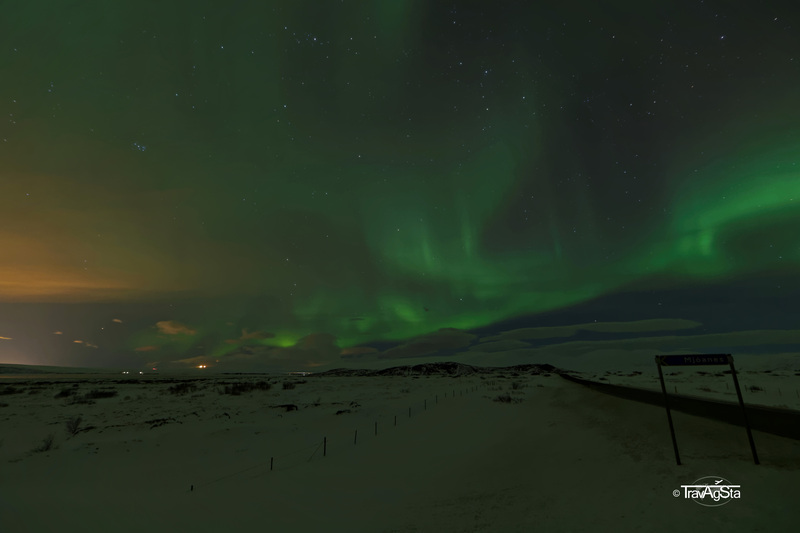 In the south of Iceland you can see the Northern Lights from 3 on. But we had two clear nights with an activity of 2 to 3 and saw nothing. But then there was one night where everything was perfect: Activity of 3 and no clouds! To be honest we can’t imagine what higher activity might look like because it was already so beautiful! When the external conditions are fulfilled you need the right place. As far away from disturbing lights as possible and a clear view to North. For great pictures you will also love an interesting foreground: a lake, trees or snow covered hills are perfect! We did some research and searched for right places. When there we just stopped along the road in slip roads. Luckily there’s not so much traffic in Iceland, so almost no cars were passing. 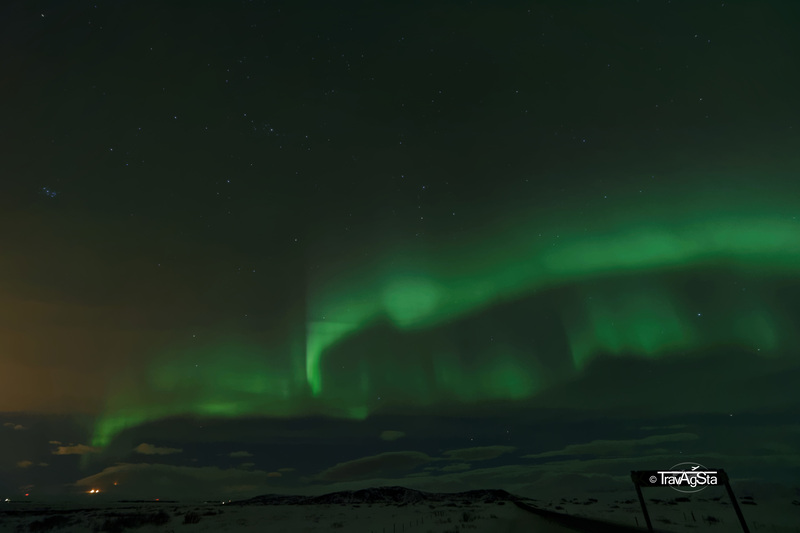 Well, now you can enjoy the dancing Northern Lights. If you want to take photos of it, you will need the right equipment. Smartphone snapshots won’t make it. Most important is a heavy tripod, as exposure time will be longer than 8 seconds. 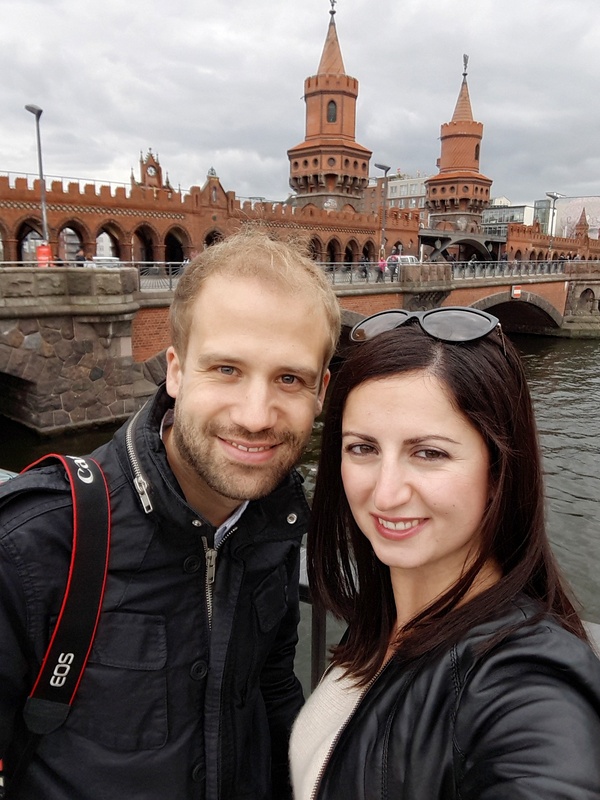 Every camera with manual mode can be used, but the larger the sensor the better. Due to high ISO you will get lots of noise. But in RAW converting you can reduce it. No problem. Lower ISO and longer exposure time would lead to moving stars and the Northern Lights blur as they are moving in the sky. I set the focus by illuminating a tree 15 metres away with my torch and using autofocus. Then turn on manual focus and don’t touch the lens anymore. For creating a time laps film later you need interval shots from the same perspective. At least 10, better more than 20 for some short film sequences. One hint for taking photos with people in the foreground. We experimented with flashlight and torch. In the end it was too bright. Best you use silhouettes or illuminate it indirectly. There’s no cure-all for different expectations. Wow, the Northern Lights look quite incredible. I’ve heard of them but never really looked at any photos – I might have to add this to my bucket list! 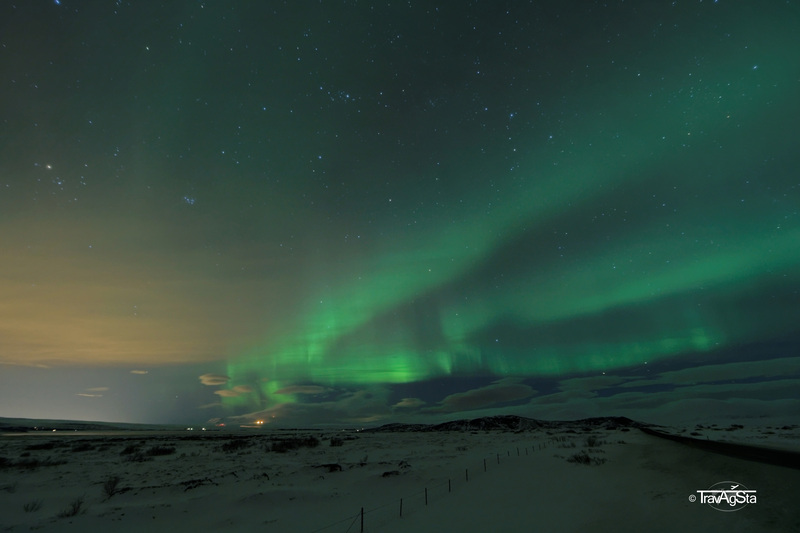 Yes, Northern Lights are a phenomenon everyone should see in his life. Just so amazing! You should add them to your bucket list and Iceland is one of the best places to see them!